Introduction, by Professor Steve Marsh, Cardiff University (321-25): In considering the evolution of international relations and the concepts behind them, we should consider two important points: Churchill’s opinion of it at the time as the most important speech he had ever delivered; and how it became embedded in Cold War historiography, achieving a durable place in collective memory. “Reluctant Partners: African Americans and the Origins of the Special Relationship,” by Clive Webb, Professor of Modern American History, University of Sussex (350-64): Noting the absence of black-owned newspapers in Levering’s survey leads to an unusual perspective on the Fulton speech: the distrust most black Americans entertained towards Imperial Britain generally and Churchill, perceived as a racist. Their response to the speech was rancorous, often scathing. What aroused the anger of that community was not the Iron Curtain analogy but the proposal for close Anglo-American relations. The National Association for the Advancement of Colored People (NAACP) led a chorus of furious opposition to what it interpreted as an attempt by the British to reestablish the prewar imperial order through the surrogate of the United States. 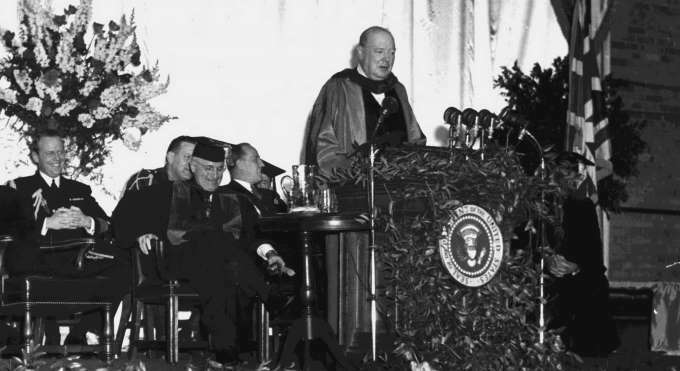 “Churchill’s decision [it was not his decision] to speak at a college that practised Jim Crow policies [blacks were not then admitted] underlined the connection between the domestic racism of the United States and the overseas exploitation of the British.” Incidentally, the NAACP and similar organisations denounced Britain’s ruling Labour Party with equal vehemence.